Summer in Japan is ghost season. The windows of every bookshop display tales of spirits and monsters, nestled between strings of paper lanterns. During the humid, uncomfortable nights, people huddle together to share these stories. There is nothing quite like the prickly, icy feeling of fear crawling over your skin to fend off the relentless heat. Forget the floating white sheets with unfinished business, who will disappear to rest peacefully once their task is complete. 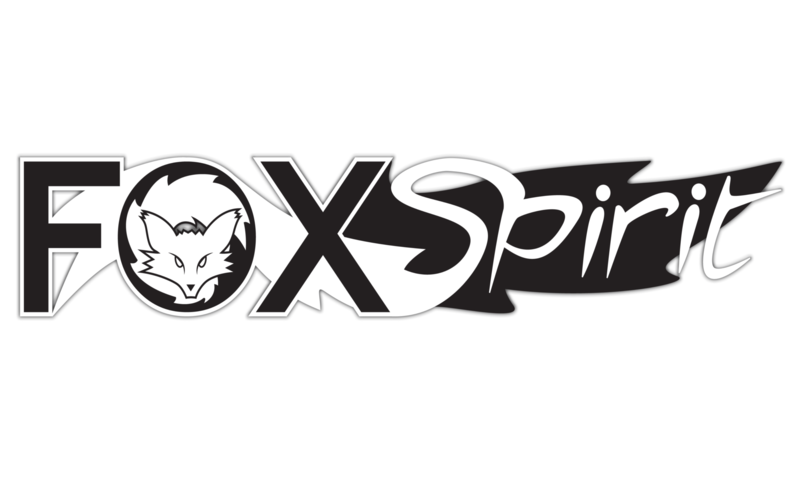 In Japan, there is a detailed classification system for different kinds of ghosts. The word yūrei is used as an umbrella term for the ghosts of deceased humans (in Japanese it is written as 幽霊, with the first symbol meaning ‘faint’ or ‘dark’ and the second meaning ‘soul’). There are many categories of yūrei. There are the shiryō; ghosts who haunt loved ones and sometimes attempt to take them to the land of the dead, kosodate-yūrei; ghosts of mothers who died in childbirth and return to care for their children, and jibakurei; spirits that are tied to a specific location. Whilst yūrei can be male or female, the prevalent image of them is female. 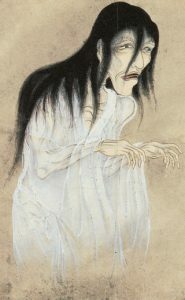 A typical yūrei is a woman with long, prehensile black hair, wearing a white burial kimono. She has no feet; instead she hovers above the ground. Each yūrei haunting is unique, as each human life and death is. As such, there is no standardised way to deal with them. Each has its own reasons for haunting, and its own terms to be fulfilled before it rests. Here we meet Okiku, the heroine of ‘Banchō Sarayashiki,’ a well-known Japanese ghost story. In a plot, she bravely helped to save the true ruler of Himeji castle and overthrow his imposter, and protected herself and her lover by defying an undesirable suitor. In revenge, the suitor framed her for the theft of a gold plate and hoped to blackmail her into marriage. When Okiku still refused, he killed her and tossed her body into the castle’s well. There she remains as a jibakurei, her wronged, restless spirit forever counting the plates in search of the missing one. People stopped visiting the well after dark, for fear of confronting her wrathful spirit. Okiku’s untimely, violent death caused her spirit eternal torment, and spread fear to those she once loved. But there is another category of yūrei which present their feelings in much more harmful ways. When people die with strong emotions, such as rage, jealousy, or hatred, their spirits remain connected to the human world, enacting vengeance on anyone or anything which crosses their path. They behave more like forces of nature than ghosts, being powerful enough to inflict illness and death and even cause natural disasters. Of all the types of yūrei, these are the ones which no-one ever wants to encounter. These are the onryō. Aside from their abhorrent deeds, what makes onryō so terrifying is that they can seldom be reasoned with or banished. Unlike other yūrei, their desire for vengeance is insatiable. 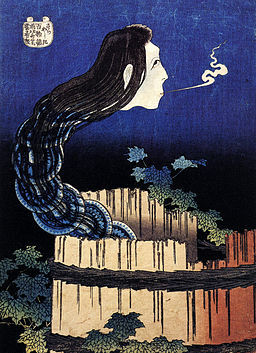 It is an old Japanese belief that women are more susceptible to high levels of emotion, which makes them more likely to transform into yūrei (and in particular onryō). This perhaps explains why the dominant stereotype of a yūrei is female. Many yūrei stories are about young women who are betrayed by lovers, die tragically during childbirth or from sickness, or are murdered for their defiance like Okiku. It’s unsettling to consider pitying something so horrifying, but knowing their stories it’s easy to understand Okiku’s and the deceased wife’s motives (if not their actions). In life, they were honest and true. Their mistreatment ignited their emotions, and gave them no choice in what they became. They induce fear not only because of their unnatural actions and appearances, but also by providing a glimpse of the corruption emotional upset can create. With understanding them comes the realisation that we could also become them if the circumstances arose. These ghost stories are not just about death and hauntings. They are also full of heartbreak, anger, rage, and jealousy. Traumatic events leave their mark on the physical world, which yūrei are tragic reminders of. Feeling these emotions makes us human, and the legends of the onryō show us that they can be the scariest things of all. Amelia Starling is a writer and folklorist who loves travelling and collecting stories. She is a graduate of Creative Writing from the University of Winchester, and lives in the UK. She blogs about folklore and fairy tales at http://thewillowweb.com, with particular interest in Japanese folklore. She is also a content editor for Folklore Thursday. You can follow Amelia on Twitter @amyelize.